The fire that destroyed the gasoline tanker Jupiter on Sept. 16, 1990, was so spectacular its smoke could be seen for nearly 50 miles. 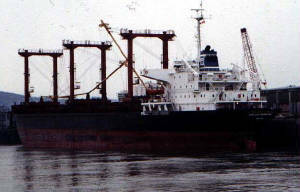 The 14-year-old vessel, owned and operated by Cleveland Tankers, Inc., of Cleveland, specialized in the delivery of highly volatile petroleum products to Great Lakes ports. On the day of the fire, the Jupiter was unloading 54,000 barrels of unleaded gasoline at the Total Petroleum dock on the Saginaw River at Bay City, Michigan. At about 8:30 a.m. that Sunday morning the up-bound motor ship Buffalo passed close by the tanker. The Coast Guard said the suction from the Buffalo’s propellers caused the Jupiter to pull away from the dock, breaking the fuel lines. There was also a spark that ignited the gasoline and the ship was quickly engulfed. At the time the tanker still had about 22,000 of gasoline still aboard. Flames shot over 100 feet into the air as members of the ships crew scrambled for their lives. One crew member dove into the river and drowned before reaching safety. The fire was so hot that the Coast Guard ships Bramble and Bristol could not contain the flames with shipboard firefighting equipment. A special team from Williams, Boots & Coots Firefighters and Hazard Control Specialists of Port Nechels, Texas, was flown in the next day to put out the blaze. It was not until Tuesday morning, Sept. 18, that the fire was extinguished. The tanker was declared a total constructive loss. The wreck was towed upriver to the old DeFoe Shipyard dock at Bay City where a crane was erected for dismantling the burned wreckage. 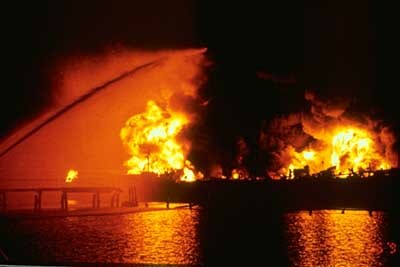 A National Transportation Safety Board later ruled that the Total Petroleum Co. was responsible for the fire because of faulty moorings. The Buffalo was thus exonerated from the primary responsibility.